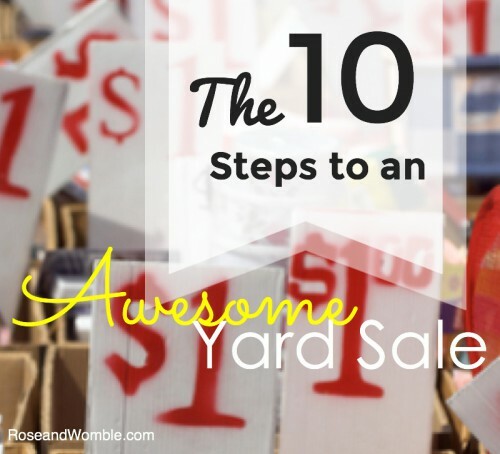 10 Steps to An Awesome Yard Sale - Rose & Womble Realty Co.
Having a yard sale as part of prepping your house to sell is a great idea. You not only get rid of stuff you don’t want to take with you to your new home, but you can also earn a little bit of extra money too. Hosting a successful yard sale is not a casual endeavor, and with the right planning and execution you can be successful. Here are the ten steps for having an awesome yard sale. One yard sale is okay and you’ll probably get some traffic – but having an entire block or neighborhood hosting a yard sale, now that will get attention. So enlist your neighbors and see if they are willing to host a yard sale the same day as you. Remember this isn’t competition but getting more traffic in and around the house you’re about to or have on the market. If your neighbors aren’t interested you can still gather your own friends and family and see if they have extra stuff they would be willing to share. To keep the profits for each person separate try having a color coding system so you know what money goes with what person. Or decide to split the profits evenly among the families who work the sale. There is power in numbers. Just like all things in real estate, you can’t simply put out a sign and hope for a sale. You need to make sure that any amount of lead time you have before the sale you use to promote. We loved the idea from Eclectically Vintage, about having a theme tied to your sale. The yard sale she and her friends hosted was called a “Purge Sale” and she was really clear and deliberate about the types of items buyers could potentially find. Focusing on this allowed her to get the right traffic into the sale. The other thing she did was have great advertising copy that grabbed the attention of buyers. Her ad was funny, charming, and had the right details. When considering placing ads you need to find the right places to put the information. Use your school and church newsletters, see if you can hang flyers at local stores, and let everyone in the neighborhood know. Remember there is Craigslist, Social Media groups that focus on yard sales, and even the old school newspaper – get the word out. Take a look at what the ad below. Having a successful yard sale means you need to have stuff, a lot of stuff to put out for the buyers. You need to go through every nook and cranny because the point of this is to get rid of stuff. Think about kitchen items you never use, old books you’ll never read again, costume jewelry, home decor, toys, clothes, old tools, old equipment, and old craft supplies. When collecting items in your house make sure to wipe them down if they are dusty and keep like items together. This could’ve gone in the advertising category but signs can make or break a yard sale. You’re going to need A LOT OF SIGNS. Directional ones with arrows pointing to the action, as well as general information ones. We love these bright pink ones from MyBlessedLife.net. She used old political campaign signs as the base and covered them with her signs. She had friends post them all over the neighborhood. Make sure you follow all city sign ordinances and make sure to remove your signs immediately after the sale. Use tables and clothing racks whenever possible – and if you do need to put items on the ground, use an old sheet to protect the items. We loved this idea from Good Housekeeping for displaying jewelry, placing items in a muffin tin to keep them organized. Putting a mirror out so people can see what they look like is also a nice touch. If you’re looking for the most money for your goods – the yard sale isn’t the spot for it. People who are hunting a yard sales are looking for serious bargains. Think about pricing in multiples for items like books, small kitchen items, and clothing. You’re trying to get rid of the stuff. Any items that are “larger price” items you might do better selling online. If you’re hosting a yard sale to purge and let people know you’re placing your home on the market then the location needs to be your house. If you’re hosting a group yard sale think about who gets the most traffic, and is the easiest to place directional signs to. Also time is important, you don’t want to be out there all day. Some of the sites we’ve researched suggested shorter morning hours are the best. Make sure any promotional signs or ads you’re using have the times listed on them. 8. Have enough change, shopping bags, and consider a tech upgrade for accepting debit and credit cards. Having enough change is critical for your success. See if you can borrow a lock box for holding change. Also having shopping bags is a nice touch for your customers, as they may be hitting more than one yard sale in a day. This is a great avenue for getting rid of all those plastic grocery bags you’ve probably acquired over the years. Now for something really cool – consider taking credit and debit cards. There are many devices, like Square, that work with your smart phone or tablet which will allow you to accept credit cards as a payment. When you swipe the card the money goes directly into your savings or checking account. Typically you have to pay a fee per swipe, but with so many people not having a ton of cash this could mean more sales. Play great music, hang streamers, and serve refreshments. People who are relaxed and having fun will hopefully stay a little longer, and will purchase a few more items. If you make the sale fun word will get out and you could also get a few more customers. This was a great tip from Making Lemonade blog, items you want to get rid of but don’t think will sell. Old paint, carpet remnants, fabric scraps. These are all items you could include.